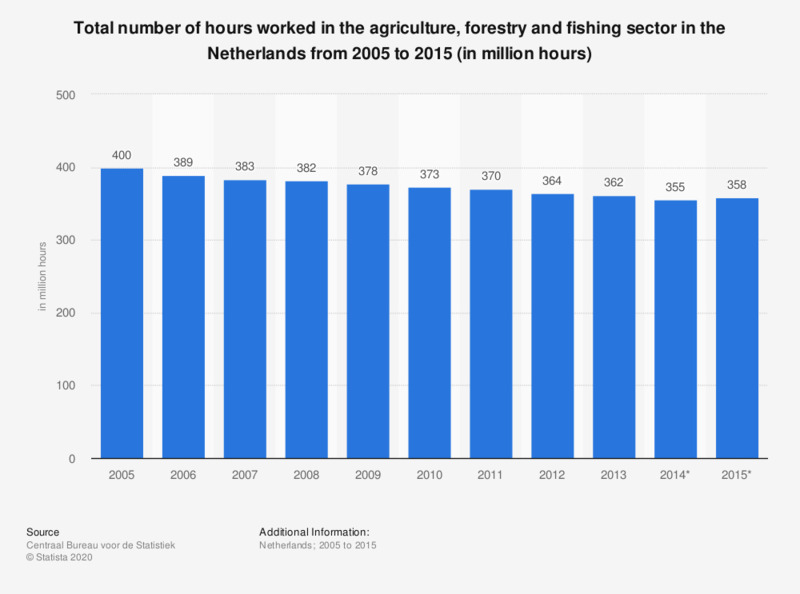 This statistic displays the total number of hours worked in the agriculture, forestry and fishing sector in the Netherlands from 2005 to 2015 (in million hours). It shows that between 2005 and 2015, the annual number of hours worked in this sector decreased from 400 to 358 million hours. The source defines the hours worked as: "The total of actually hours worked of an employee or self-employed person. The total of working hours of employees is calculated by adding the hours paid for (the amount of agreed upon hours and paid overtime) to the unpaid overtime less the amount of hours that is paid for but not actually worked. This includes hours of sick leave, maternity leave, strikes etcetera. The hours worked for the self-employed are directly determined." * The figures for 2014 and 2015 are provisional.